Between Howard Stark on "Agent Carter" and Tony Stark in "Iron Man," it seems that the Starks cannot hold onto their goods. What this family business sells is constantly falling into the wrong hands. 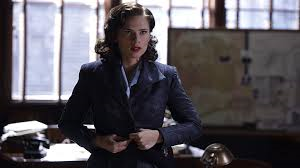 In tonight's episode, Peggy Carter (Hayley Atwell) is still secretly helping Howard Stark retrieve his items that have been stolen by the mysterious Leviathan organization. At the end of last week's episode, we learned that the SSR has recovered a license plate that came off the car of Edwin Jarvis (James D'Arcy) Howard Stark's butler who was assisting Carter last week. The SSR finds out who the license plate belongs to, and Edwin Jarvis is brought in for questioning. What was fascinating about tonight's episode is that Jarvis isn't exactly what he seems and that there are some dark secrets tucked away in his history. Secrets that even Howard Stark tried to cover up, its an interesting set up for what could have been a cliché, one-dimensional character and I love that the show went big with it. I think the work done by James D'Arcy continues to be the highlight performance of the show, and that his presence isn't wasted. Peggy and Jarvis find a lead on some of Howards items and it leads them to a boat. Once again James D'Arcy proves why he won the role on this series, he has a "anonymous tip" call that is so funny that I couldn't believe he pulled it off, and I am starting to think that D'Arcy and his Jarvis character will become the heart and soul of this series. I think he pulls off great chemistry with Hayley Atwell, who I thought once again provided great work on the show. She proves once again that she is a strong lead and more than worthy of leading this show on her own. Very good work from the cast overall. We don't learn much more about the Leviathan group and no other Marvel Easter Eggs are dropped on this episode, but we do learn that the stakes are going to be pretty high for this series. At the very end of the episode, one of Carter's colleagues is murdered, probably at the hands of Leviathan. Its a moment they spend more time on that I thought, especially since this particular character was not fond of Carter, but it is enough to make his passing matter. I can't wait to see what this might mean for the rest of the show and how this film will fit into this mold. I also liked that the film once again felt very authentic to its time period. Already on Facebook, I have read how many fans did not like how Peggy Carter has been treated on this show, particularly after she makes a brief "mistake" in this show. But it seems "Agent Carter" is channeling "Mad Men" to a degree. This was the time period and this is how people behaved. Yes, its despicable by today's standards, but the show does not take place today. I like that the show is quite authentic. The show may have been a little slower this week, but I am still hopeful for more and I can't wait to see what happens in two weeks.